A web-item is a button or link that will appear at your chosen location. 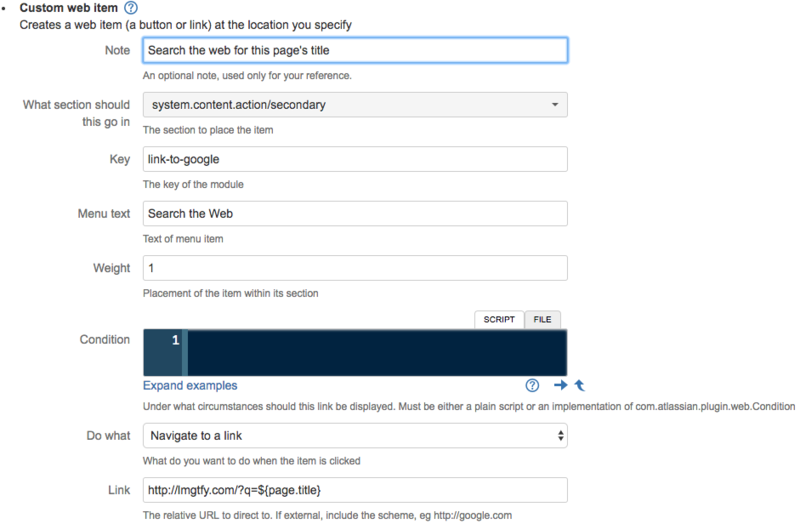 You can understand what the values of the section attribute mean by reading the Atlassian documentation on Web UI modules , or you use the section finder tool. Clicking the link should take you to Google. Experiment with the Weight field - try setting it to 1. When you refresh the page you should find that your link is now the left-most one. So far, so easy, but not very useful. Next we’ll try to add a link to Confluence wiki pages, which will do a Google search on the title of the current page. Note that the URL is processed with velocity before rendering. The variables you can use depend on the context of the Web Item. If you don’t change the key, the module from the first part of the tutorial will be overwritten. body : "You have signified your approval of this page"
Verify that this works by browsing to: http://<confluence-url>/rest/scriptrunner/latest/custom/approve?pageId=12345. It should simply respond with some JSON. If you are doing something with the page be sure to enter a valid page ID. The problem we have now is that will probably want to limit approving a page to just those in a certain group, or with a certain space permission. Also, we don’t want to show the menu item if the page has already been approved. Which brings us to Conditions. The condition is used to define whether the link should be shown or not, and it can use anything available in its context, plus details of the current user. If the item is on a wiki page, you will get the page and space etc. 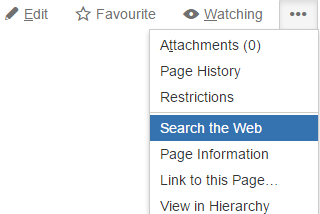 If it is on a space admin section then you may only get the space. In Confluence the context variable is an instance of WebInterfaceContext, you can use its methods to retrieve the current page etc. Let’s say that we want to only show the Approve menu item where the current user is a space admin, and the current page does not already have the approved label. Enter this in as the Condition. It can either be entered inline or written to a file underneath a script root. You should be able to see now that it doesn’t appear for users that are not space admins, or when the page is already labelled approved. Conditions must be written defensively. What is available in the context or jiraHelper map depends on the particular web section, and the page that it’s viewed on. For instance, a link in the top section (system.header/left) will not always have the same context variables. 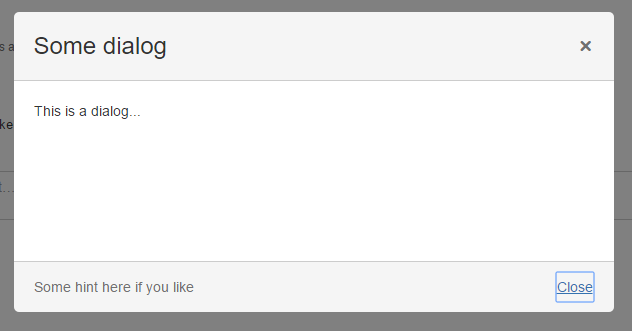 When viewed on the dashboard, it may contain just the current user, when you are looking at a page in a space, you will have a reference to the current Page object. Therefore, check that context variables are not null before calling methods or properties on them. If you are using a section like system.content.action, you can assume you will always have the page context variable defined. As well as using a script, you can use a concrete class that implements Condition. Why would you want to do this? Because you may wish to extend your own existing Condition, or one provided by the application. You can include your additional dialog with a web resource fragment. 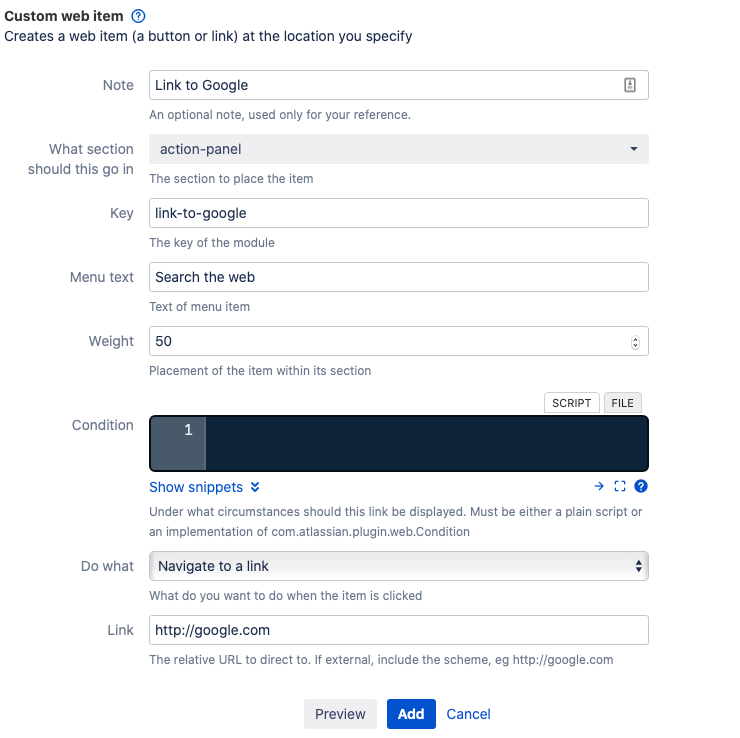 Make sure to select Navigate to a link as the intention setting.